After purchasing its double-deck Karrier WL6/2’s in 1927/28, Portsmouths next double-deck purchase was seven petrol-engined Leyland TD1’s numbered 4-10. Numbers 4-6 and 9-10 had Short Bros. bodies like that of the diesel AEC Regent posted elsewhere on this site. A diesel Crossley Condor also had a Short Bros. body. Numbers 7 and 8, however, had rather attractive 5-bay Park Royal bodies, never purchased before or afterwards. They had long lives, RV 716 being withdrawn in 1950 aged 19 years and RV 715 in 1952, aged 21 years. Yes Chris, this pair of Park Royal bodied TD1’s looked smart, even in later life, when the whole bonnet area was painted red, and the depth of the white waist rail reduced. However, I’m too young to remember seeing them, and can only rely on photos like these! Thank you. 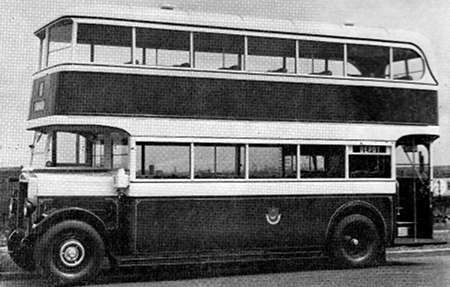 These were Portsmouth’s first Leylands (also a single-deck Lion, No 3). Portsmouth bought 8 bodies from Hall Lewis in 1929 (4 each Dennis EV and Thornycroft BC), and 5 bodies from Park Royal (the Lion mentioned here, the two TD1s as the subject of this posting, and 2 TSM B10A2s. Park Royal never again featured in CPPTD orders, and the main suppliers became English Electric then Cravens in the 1930’s, and Metro-Cammell and Weymann post-war. This official looking portrait also shows a neatly lined out lower deck panel, but no lining out on the ‘tween deck panels. The reason for this was queried on the earlier posting of the Portsmouth AEC Regent with Short Bros body, No. 35. This was also a pre-entry to service official picture. I believe that the reason for this was to allow advertisements to be placed on the bus before entry to service. Why paint ornate lines which were going to be covered over? The extent of the adverts can be seen on the posting for the Portsmouth Corporation TSM E60A6. The side adverts cover virtually the full length of the vehicle. Post-war, this changed, and buses had lining out on the sides in front of and behind the adverts, which only covered the centre bays, not full length. I thought that Park Royal was formed out of Hall Lewis, so the batches of 8 buses and 5 were really from the same stable. Yes, Petras409, Hall Lewis did become Park Royal. In a summary, Alan Townsin states that Hall, Lewis & Co Ltd was formed in 1924, and was based at Abbey Road, Park Royal, London. AAT states that the origins of this are complex and go back to 1889. Hall, Lewis was involved in other transport interests, not just a successful bus body building programme. In spite of some sizeable and successful contracts, the firm became bankrupt in early 1930. One of the creditors, a Mr Harry Yager, bought the business, and it was renamed Park Royal Coachworks, as from April 1930. Before the 1930 change, there was a link to Northern Counties of Wigan through the Lewis family, but the Lewis family retained their interests in NCME when Hall Lewis was bought by Yager and became Park Royal. This is a mere summary of Alan Townsin’s summary in Vol 2 of his book Park Royal Vehicles 1942-1980. Portsmouth Corporation, however, did not avail themselves of their products after this initial foray, leaving Provincial on the other side of Portsmouth Harbour to build up a fleet of Park Royal-bodied AEC Regents, and Southdown to run into Portsmouth using Leyland TD4 and TD5, some with Park Royal bodies. Thank you, Petras409 and Michael H for respectively asking and answering a queaion that I was going to ask! A lovely photo Chris , from a super period in bus history! It does show how dated the TD1 was in its chassis geometry though. The space between the front bulkhead and the wheel centre was greater than most of its contemporary competitors such as the more recent Regent, and Daimler designs, and it was not until the TD3 that this feature was brought into line with "fashion". There was the whole TD2 model to go through first! By 1931, Rackham inspired bow fronted bodies were coming into fashion, as typically exemplified by Weymann, Brush etc, and this was a most fascinating chapter in the evolution of bus design. In other TD1 photos I’ve seen, John, the rear of nearside wings all curve rearwards to avoid a total gap, even slightly earlier Hall, Lewis ones. The original photo of this vehicle is not clear enough to work out the actual situation, but it is strange that the safety rail projects forward of the front bulkhead, so maybe the wing just follows the tyre shape and leaves a gap. I think the bodywork style gives the bus the impression of being slightly later than 1931, partly because the stubby radiator in not obvious. It’s all subjective, I know, but I find this double-decker about as good-looking as a bus can get. That nice forward-set front axle was part of the appeal of the Reading TD1s, along with the subdued engine note and howling gearbox. They had Leyland bodies but–as John W points out–it was the chassis that dictated the overall look. Lucky old Portsmouth always got handsome buses especially with that wonderful livery. I agree, Ian, that it has that certain elegant simplicity about it. Of course, it looks very tidy around the windows, presumably because it has one-piece three-quarter wind-down opening ones, so beloved at this time, but not for much longer. This aids the impression of a light, airy appearance inside. This picture appears in the October 1964 issue of buses illustrated as part of the Portsmouth edition and is part of a contributor’s personal favourites. According to the article, this is number 8- RV 716. Thx, Dave F, for clarifying which of the two it was. I agree that, for its time, it’s quite handsome.